Part 3 of the TED Radio Hour episode Wired For Altruism. 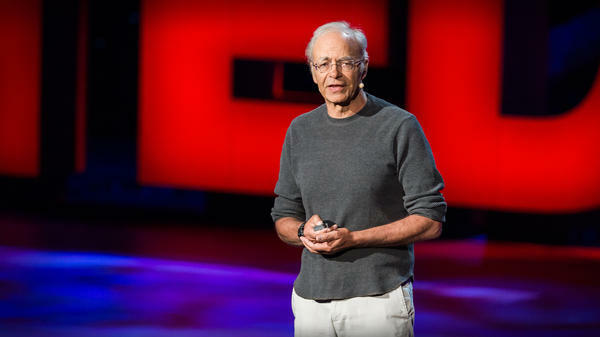 Philosopher Peter Singer's work focuses on "effective altruism" — how to do the most good to make the world a better place. He argues effective giving involves balancing empathy with reason. Peter Singer is the Ira W. DeCamp Professor of Bioethics at Princeton University and Laureate Professor at the University of Melbourne. His research focuses on applied ethics, philosophy, and "effective altruism." Peter is the co-founder of non-profit, The Life You Can Save, which is devoted to improving the lives of people living in extreme poverty. He is the author of several books including Animal Liberation, Practical Ethics, and The Life You Can Save. I want to ask you about this really famous Talmudic notion - actually, it might be that in the Quran as well - but this idea that, you know, if you save a single life, then you have saved all of humanity. You know that one? PETER SINGER: Yes. I think it's Talmudic, but who knows? Maybe it's the Quran as well. RAZ: And do you think that's just total nonsense? SINGER: Sadly, yes I do. RAZ: This is the renowned and somewhat controversial philosopher Peter Singer. He teaches at Princeton. SINGER: I mean, of course, you know, if it's encouraging people to save one person rather than not to save anyone, that's a good thing. But if you really take it literally, I don't see how anyone could really think that if you have a choice between saving the life of one person and saving the lives of a million people, to say - well, I've saved the one - can you really take that seriously? I can't. RAZ: For decades, Peter Singer has asked really big ethical questions, specifically about suffering and how we should all work to reduce it, which has brought him to a very different definition of altruism. Peter explained his idea on the TED stage by starting out with a news clip. And you might remember this. It's about a horrific incident in China a few years ago when a van ran over a toddler. UNIDENTIFIED REPORTER: Within two minutes, three people pass 2-year-old Wang Yue by. The first walks around the badly injured toddler completely. Others look at her before moving off. SINGER: There were other people who walked past Wang Yue before a street cleaner raised the alarm. She was rushed to hospital, but it was too late. She died. I wonder how many of you looking at that said to yourselves just now, I would not have done that. I would have stopped to help. As I thought, that's most of you, and I believe you. I'm sure you're right. But before you give yourself too much credit, UNICEF reports that in 2011, 6.9 million children under 5 died from preventable poverty-related diseases. 6.9 million is 19,000 children dying every day. Does it really matter that we're not walking past them in the street. Does it really matter that they're far away? I don't think it does make a morally relevant difference, the fact that they're not right in front of us, the fact, of course, they're of different nationality or race. None of that seems morally relevant to me. What is really important is can we reduce that death toll? Can we save some of those 19,000 children dying every day? And the answer is, yes, we can. Each of us spends money on things that we do not really need. You could take the money you're spending on those unnecessary things and give it to this organization the Against Malaria Foundation which would take the money you had given and use it to buy nets to protect children. And we know reliably that if we provide nets, they're used, and they reduce the number of children dying from malaria. Fortunately more and more people are understanding this idea, and the result is a growing movement effective altruism. It's important because it combines both the heart and the head. The heart, of course, you felt. You felt the empathy for that child, but it's really important to use the head as well to make sure that what you do is effective and well-directed. RAZ: For Peter, effective altruism is the most efficient way of giving money that will have the maximum impact and benefit, which means finding organizations that will make the most out of your contribution to save the most lives or to alleviate the most amount of suffering. SINGER: Most people don't think about that, and they don't realize that if they thought a little bit about which charity they ought to direct their time and money and resources to, they could do 10 times, perhaps, 100 times, perhaps, in some cases even 1,000 times as much good. Charitable giving is a huge sector in the United States. It amounts to $350 billion a year. And yet, I can't help feeling that a lot of that is wasted because people have not been thinking about how to do it as effectively as possible. SINGER: Take for example providing a guide dog for a blind person. That's a good thing to do, right? All right. It is a good thing to do. But you have to think what else you could do with the resources. It costs about $40,000 to train a guide dog and train the recipient so that the guide dog can be an effective help to a blind person. It costs somewhere between 20 and $50 to cure a blind person in a developing country if they have trachoma. So you do the sums, and you could provide one guide dog for one blind American or you could cure between 400 and 2,000 people of blindness. I think it's clear what's the better thing to do. This is the website of the Bill and Melinda Gates Foundation. And if you look at the words on the top right hand side, it says all lives have equal value. That's the rational understanding of our situation in the world that has led to these people being the most effective altruists in history. Bill and Melinda Gates and Warren Buffett. SINGER: No one, not Andrew Carnegie, not John D. Rockefeller, has ever given as much to charity as each one of these three. And they have used their intelligence to make sure that it is highly effective. According to one estimate, the Gates Foundation has already saved 5.8 million lives and many millions more of people getting diseases that would have made them very, sick even if eventually they survived. Over the coming years, undoubtedly, the Gates Foundation is going to save a lot more lives. RAZ: All right. So - I'm a little bit conflicted over this idea that, you know, on the one hand people like Bill and Melinda Gates - who I should add also contribute to NPR - you know, or Warren Buffett, they've done so much incredible work to alleviate global poverty. But on the other hand, I mean, I think the amount they've given isn't really a sacrifice for them - right? - because it probably hasn't made much of a difference in the way they live their lives. You know what I mean? SINGER: Oh, I do know what you mean exactly. And I agree. I think Bill Gates has given away 25 billion, but he's still got more money than he could possibly really spend and the same for Warren Buffett. But I still think we ought to praise Gates and Buffett for the amount of good that they've done because they've set an example to others, and they're influencing others as well. RAZ: But I sometimes wonder whether, you know, the way we venerate our wealthy philanthropists, it kind of takes the shine off the altruism. You know? Like wouldn't it be a higher form of altruism if someone gave a lot without receiving, you know, any kind of recognition? SINGER: I don't take that view about motivation. I'm more interested in outcomes than I am in the question of who is the purest and most noble altruist of all? You know, I think they were all motivated by the idea of doing good. And I'd much rather be part of a society which greatly honors and respects people who are altruists and who are effective in their altruism, than one that either admires people because they're, you know, celebrity movie stars or because they're super wealthy just no matter what they do with their wealth because I think we ought to try to encourage more people to act in that way. RAZ: In the moment philosopher Peter Singer on how all of us could be effective altruists. I'm Guy Raz, and you're listening to the TED Radio Hour from NPR. RAZ: It's the TED Radio Hour from NPR. I'm Guy Raz. And on the show today, ideas about Altruism, from extraordinary altruists who have given a kidney to a complete stranger to effective altruists like philosopher Peter Singer. SINGER: Effective altruism is the form of altruism in which we bring our rational capacities to bear in order to do the most good that we can. RAZ: And you don't need to be a billionaire like Bill Gates or Warren Buffett to be an effective altruist. In fact, you can choose to live on a modest income and then give the rest away. Or you can choose what Peter calls an ethical career. SINGER: In terms of, how can I do the most good? What is the most ethical career for me to enter into? RAZ: And Peter's definition includes what you might normally think of as ethical, like studying medicine and then working in a developing country or becoming an aid worker. But it also includes careers that you might not normally think of, like becoming a Wall Street banker. SINGER: If you have the abilities to earn a lot of money and if you have the character to persist in giving that to the most effective charities you can find, then that may be the best thing that you can do. And - also, if you do become a Wall Street banker, I think you need to be aware of what you're doing in terms of your daily work, not just earning money to give a lot away. But you need to think about - am I harming people through the work that I'm doing? RAZ: OK. So let's say, you know, you're a highly paid Wall Street banker, and, you know, your work is kind of neutral. You're not harming anyone. You're - you know, you're giving away a lot of your money to effective charities. And let's say you're thinking about, you know, taking an hour to work in a soup kitchen. Would it be better to work that hour in a soup kitchen or just, you know, donate the money? SINGER: Well, if I'm a highly paid Wall Street worker and I'm losing many hundreds of dollars, perhaps even thousands, by going to work for the soup kitchen, then it would be better for me to keep working. Now, you know, maybe I feel I need a break from the office. Maybe I feel I need to meet some real people outside my Wall Street bubble. You know, you can think of stories as to why it would be good for me. SINGER: But in terms of the difference I make by ladling out soup, no. You know, it would be much better for me to donate to the organization so it could employ somebody to ladle out the soup while I continue to earn my hundreds of dollars an hour and have more to give. RAZ: But Peter, I mean, you could have chosen a career, you know, where you would have made a lot more money. And then you could have given away a lot more money. Right? I mean, but you didn't. And, I mean - who knows? - you've probably had a lot of influence on people through your writing and teaching. But, I mean - do you know what I mean? SINGER: Yes. You're right about that. Looking back on my career, I think I've been extremely fortunate to be in the right place at the right time in order to have the influence that I did. RAZ: But, I mean, couldn't you argue that your decision to become a philosopher was a selfish act? SINGER: Why exactly a selfish act? I mean, I'm not denying that it was. But why are you saying that? RAZ: Because you could have - because if you could have made a lot more money doing something else, you could have given a lot more money away. SINGER: That's true. But on the other hand, I wouldn't have had the influence that I've had through my writing. RAZ: But you didn't know that. You didn't know that going in. SINGER: I didn't. I - absolutely I didn't. And, you know, if you're asking me, what were my actual motivations? - then I just found philosophy very interesting. That's true. So yeah, you could say that my motivation was not the best. And if I'd thought about the possibility of going into business to earn a lot of money and give it away, that that would have been a more reasonable choice for me to make at the time. I didn't even think about that either, I have to say. SINGER: I wasn't really thinking that ethically, as I should have been at the time. RAZ: Earlier, Peter, you mentioned the $350 billion a year in charitable contributions that are given away just in the U.S. alone. And I'm just wondering, if everyone who gives money were to practice effective altruism, you know, could we resolve some of the biggest problems we face? SINGER: We certainly would resolve the problems of the charities that are working in areas where they can do the most good. So if you consider that the U.S. foreign aid budget is 30 billion, yes, we could make a major contribution to reducing global poverty, start to deal much better with some of the other big environmental problems that the world faces. So I think we could solve a lot of problems. RAZ: Philosopher Peter Singer - he teaches at Princeton University. You can watch his entire talk as well as find resources on effective charities at ted.com.